Feynman’s 28th Lecture in his series on electromagnetism is one of the more interesting but, at the same time, it’s one of the few Lectures that is clearly (out)dated. In essence, it talks about the difficulties involved in applying Maxwell’s equations to the elementary charges themselves, i.e. the electron and the proton. We already signaled some of these problems in previous posts. For example, in our post on the energy in electrostatic fields, we showed how our formulas for the field energy and/or the potential of a charge blow up when we use it to calculate the energy we’d need to assemble a point charge. What comes out is infinity: ∞. So our formulas tell us we’d need an infinite amount of energy to assemble a point charge. We’ll have an energy flux density vector – i.e. the Poynting vector S – as well as a momentum density vector g all over space. Both are related through the g = S/c2 equation which, as I explained in my previous post, is probably best written as cg = S/c, because we’ve got units then, on both sides, that we can readily understand, like N/m2 (so that’s force per unit area) or J/m3 (so that’s energy per unit volume). On the other hand, we’ll need something that’s written as a function of the velocity of our positron, so that’s v, and so it’s probably best to just calculate g, the momentum, which is measured in N·s or kg·(m/s2)·s (both are equivalent units for the momentum p = mv, indeed) per unit volume (so we need to add a 1/ m3 to the unit). So we’ll have some integral all over space, but I won’t bother you with it. Why not? Well… Feynman uses a rather particular volume element to solve the integral, and so I want you to focus on the solution. The geometry of the situation, and the solution for g, i.e. the momentum of the field per unit volume, is what matters here. c2 is just c2, i.e. our weird constant (the square of the speed of light) which seems to connect everything to everything. Indeed, think about stuff like this: S/g = c2 = 1/(ε0μ0). That’s an amazing result. We don’t need to give our electron any rest mass: just its charge and its movement will do! Super! So we don’t need any Higgs fields here! 🙂 The electromagnetic field will do! Well… Maybe. Let’s explore what we’ve got here. So, frankly, we’re spot on! Well… Almost. The two numbers differ by 1/3. But who cares about a 1/3 factor indeed? We’re talking rather fuzzy stuff here – scattering cross-sections and standard deviations and all that – so… Yes. Well done! Our theory works! So that formula does not respect Einstein’s universal mass-energy equivalence formula E = mc2. Now, you will agree that we really want Einstein’s mass-energy equivalence relation to be respected by all, so our electron should respect it too. 🙂 So, yes, we’ve got a problem here, and it’s referred to as the 4/3 problem (yes, the ratio got turned around). So… Yes… Pretty ad hoc. Worse, according to the Wikipedia article on electromagnetic mass, that’s still where we are. And, no, don’t read Feynman’s overview of all of the theories that were around then (so that’s in the 1960s, or earlier). As I said, it’s the one Lecture you don’t want to waste time on. So I won’t do that either. OK… But… Yes? Hey! How did we get that electron radius in that formula? Now, we then assume this energy must be equal to the energy that’s needed to assemble the unit charge from an infinite number of infinitesimally small charges, thereby also assuming the unit charge is a uniformly charged sphere of charge with radius a. Now that is not kosher, really! First, it’s (a) a lot of assumptions, both implicit as well as explicit, and then (b) it’s, quite simply, not a legit mathematical procedure: calculating the energy in the field, or calculating the energy we need to assemble a uniformly charged sphere of radius a are two very different things. Well… Let me put it differently. We’re using the same laws – it’s all Maxwell’s equations, really – but we should be clear about what we’re doing with them, and those two things are very different. The legitimate conclusion must be that our a is wrong. In other words, we should not assume that our electron is spherical shell of charge. So then what? Well… We could easily imagine something else, like a uniform or even a non-uniformly charged sphere. Indeed, if we’re just filling empty space with infinitesimally small charge ‘elements’, then we may want to think the density at the ‘center’ will be much higher, like what’s going on when planets form: the density of the inner core of our own planet Earth is more than four times the density of its surface material. [OK. Perhaps not very relevant here, but you get the idea.] Or, conversely, taking into account Poincaré’s objection, we may want to think all of the charge will be on the surface, just like on a perfect conductor, where all charge is surface charge! You’ll say: 10% is 10%. It’s huge in physics, as it’s supposed to be an exact science. Well… It is and it isn’t. Do you realize we haven’t even started to talk about stuff like spin? Indeed, in modern physics, we think of electrons as something that also spins around one or the other axis, so there’s energy there too, and we didn’t include that in our analysis. Why? I am not sure. I must assume it’s got to do with the standard deviation and all that. The point is, we’ve got a 2/3 factor here too, so do we have a problem really? I mean… The a we got was equal to a = (2/3)·re, wasn’t it? It was. But, unfortunately, it doesn’t mean anything. It’s just a coincidence. In fact, looking at the Thomson scattering cross-section, instead of the Thomson scattering radius, makes the ‘problem’ a little bit worse. Indeed, applying the π·r2 rule for a circular surface, we get that the radius would be equal to (8/3)1/2·re ≈ 1.633·re, so we get something that’s much larger rather than something that’s smaller here. The radius that’s associated with the energy that’s needed to assemble our electron from infinitesimally small charges, and so that’s based on Coulomb’s law and the model we use for our electron: is it a shell or a sphere of charge? If it’s a sphere, do we want to think of it as something that’s of uniform of non-uniform density. The second radius is associated with the field of an electron, which we calculate using Poynting’s formula for the energy flow and/or the momentum density. So that’s not about the internal structure of the electron but, of course, it would be nice if we could find some model of an electron that matches this radius. Finally, there’s the radius that’s associated with elastic scattering, which is also referred to as hard scattering because it’s like the collision of two hard spheres indeed. But so that’s some value that has to be established experimentally and so it involves judicious choices because there’s probabilities and standard deviations involved. So this integral is actually quite simple: it just integrates E•E = E2 over all of space. The illustration below shows E as a function of the distance r for a sphere of radius R filled uniformly with charge. So the field (E) goes as r for r ≤ R and as 1/r2 for r ≥ R. So, for r ≥ R, the integral will have (1/r2)2 = 1/r4 in it. 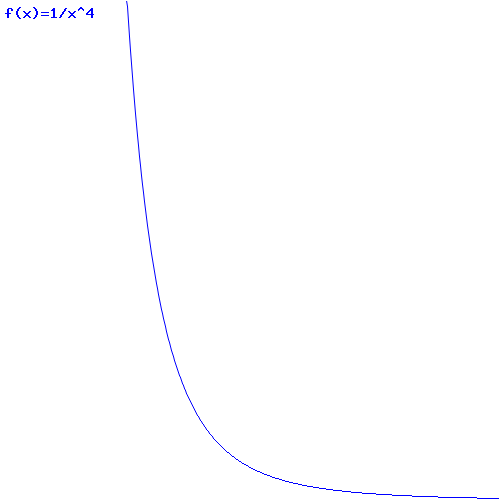 Now, you know that the integral of some function is the surface under the graph of that function. Look at the 1/r4 function below: it blows up between 1 and 0. That’s where the problem is: there needs to be some kind of cut-off, because that integral will effectively blow up when the radius of our little sphere of charge gets ‘too small’. So that makes it clear why it doesn’t make sense to use this formula to try to calculate the energy of a point charge. It just doesn’t make sense to do that. This entry was posted in Philosophy of science, Physics and tagged classical electron mass, classical electron radius, contradictions in classical theory, E=mc2, electromagnetic energy, electromagnetic mass, electron as a ball of charge, field energy, fine-structure constant, Higgs field, model of an electron, Poincaré, Poincaré stresses, Thomson scattering radius. Bookmark the permalink.